Hey there, your last two links have an extra http in it and hence, do not work. Just thought you show know. Interesting stuff you have there! FIXED, it wasn't extra http, it was a lack of a quotation mark on the end. Thanks for letting me know! And I appreciate it. Awhile back I saw a shirt on eBay that would have been perfect for me. It had a picture of dogs playing poker but it had robot dogs from various science fiction shows. Among them was the Daggit from Battlestar Galactica, K9 from Doctor Who, a few I didn't recognize and an Aibo for good measure. Only problem was that was back when I weighed 320 pounds and they didn't have one in my size. Now I can wear an XL but last I checked it wasn't available anymore. Because this sounded very cool, I took to the interwebs, and I have awesome news for you! 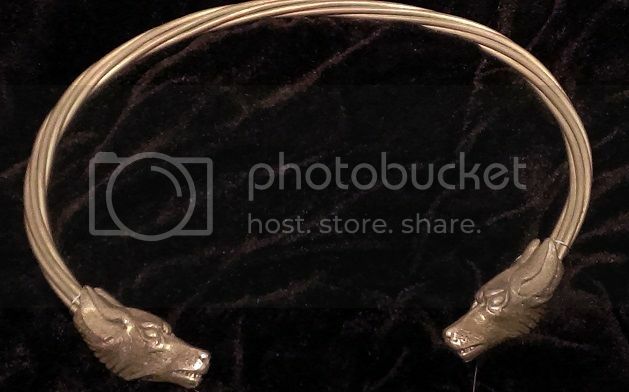 I wear my wolf torc. Come to think of it, I haven't worn this in a couple of months and that kinda blows. That IS awesome news! I'm getting that shirt ASAP. I have been an avid collector of primate tat for a good 5 years, got a huge collection built up and that includes tshirts. So I tend to wear one of my ape tees without really thinking since I have so many of them, though I do like to wear some sort of accessory because it's like they're little charms in a way. But some days I throw any old clothes on then after I've been out for a while I realise I'm wearing chimp teeshirt, bag with chimps on it, bracelet with chimps on it, standing in a toy shop looking through plush chimps. Then I feel really stupid. Well, I'm not a robot dog like I thought I was ( but I still want that shirt ). I've been thinking about buying a denim jacket, getting one of my Furbys taking them to the local airbrush shop and having the Furby airbrushed on the back of the jacket. Furby shirts exist, but they don't sell them in my area. They also sell hats with Furby ears and logo on them. Someday I may get around to buying one on eBay. I wear Wolf T-shirts and fluxfur jackets. I also wear Wolf hats and I now wear a Nordic Viking Wolf necklace. Huh, I thought I had posted in this thread before. Maybe we have a similar one somewhere? There's also not a lot of coyote-specific clothes out there. I know I've shared the antler chip necklace I made, with the coyote track. This year I also put together a choker with a coyote tooth and claw on it. Subtle items. I actually have never even been asked anything about either. I almost forgot that a friend sent me a button-up shirt with little skeches of coyotes on it. They are distinctly coyotes. I was pretty amazed when I saw the shirt in a store, and that friend actually just randomly ordered one for me in my size. I haven't had a chance to wear it. But again, it's pretty subtle. I do have one graphic tee that features a coyote, among other things. It has a bunch of "vermin" animals and says the word "Pest" along with many synonyms. I have a lot of costume items, too. But those are for costuming times, haha .